VINEGARS & BALSAMICS Archives - Lettieri & Co.
Antica Fattoria is an authentic Balsamico di Modena with the signature balance of sweet and sour that exemplifies a quality balsamic vinegar. The Champagnotto collection includes a selection of some of Giusti?s most popular balsamicos. The attractive ?bottlettes? are perfect as a stand alone gift, or a luxurious addition to a gourmet gift basket. Firm flavor and intense bouquet characterize the Giusti Silver, born from the selection of excellent musts and vintage wine vinegars. The Champagnotto collection includes a selection of some of Giusti?s most popular balsamicos. The attractive ?bottlettes? are perfect as a stand alone gift, or a luxurious addition to a gourmet gift basket. Extraordinarily dense, with a pleasantly sweet aftertaste.From the old recipe of Riccardo Giusti, a selection of the latest harvest and a long ageing in the antique barrels of Giusti's family renders the round, full bodied balsamic. The Champagnotto collection includes a selection of some of Giusti?s most popular balsamicos. The attractive ?bottlettes? are perfect as a stand alone gift, or a luxurious addition to a gourmet gift basket. 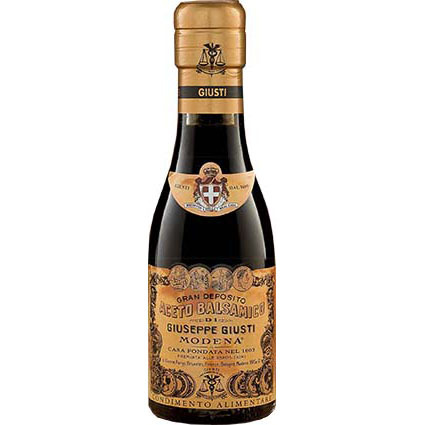 This special quality of Balsamic Vinegar of Modena is a limited production created to celebrate the four centuries of Giusti's activities. Fourth Centenary, obtained from the most precious grapes, is aged for many years in precious barrels dating back to the 1800's, drawing aromas and flavors left centuries before. The Champagnotto collection includes a selection of some of Giusti?s most popular balsamicos. The attractive ?bottlettes? are perfect as a stand alone gift, or a luxurious addition to a gourmet gift basket. 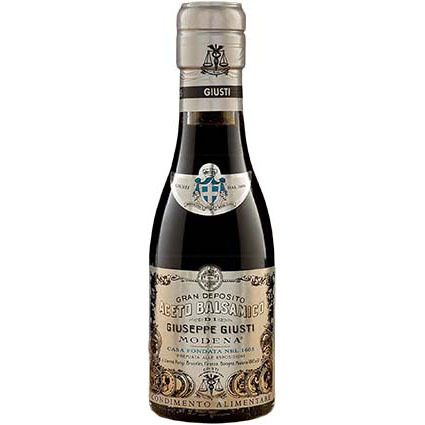 "Banda Rossa" has always been the pride of the Giuseppe Giusti's Balsamic Vinegars. The family's precious reserve, a limited quantity is released only after extensive ageing in the precious barrels of the Acetaia. The result is an irresistible mellow balsamic with superb aroma and fruity notes, which make it a unique product, pure pleasure for the most special occasions. The Champagnotto collection includes a selection of some of Giusti?s most popular balsamicos. The attractive ?bottlettes? are perfect as a stand alone gift, or a luxurious addition to a gourmet gift basket. 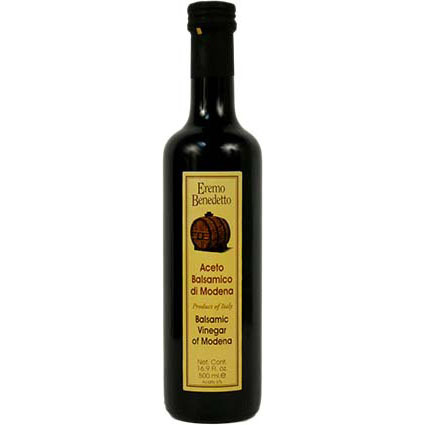 Rich bouquet and perfect balance between sweet and sour makes the Gold a very versatile balsamic vinegar. 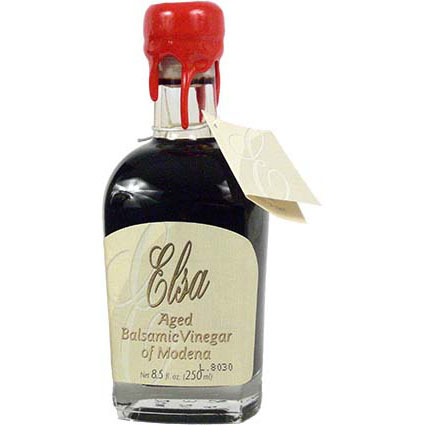 Aged for 12 years, this balsamic is obtained through the traditional method of slowly fermenting cooked grape must from the Emilia-Romagna region of Italy. The vinegar's refinement is derived from the process of aging in small casks of selected woods. A well balanced condiment with a taste of sweet and sour, it is aromatic with a rich velvety brown color. Use in salads, dipping or with grilled meats or vegetables. 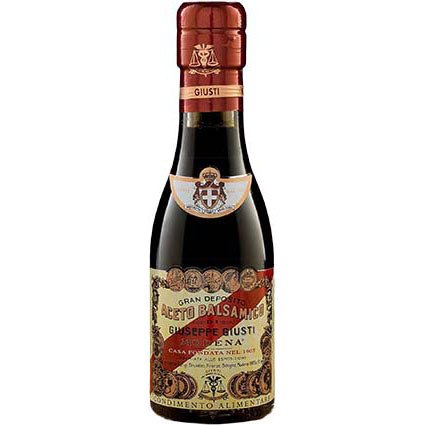 Aged for 6 years, this balsamic has a fine balance of fruit and acidity. This is a pleasant surprise for such a young balsamic. Use on fresh tomato salads, or for marinades for chicken or red meat. 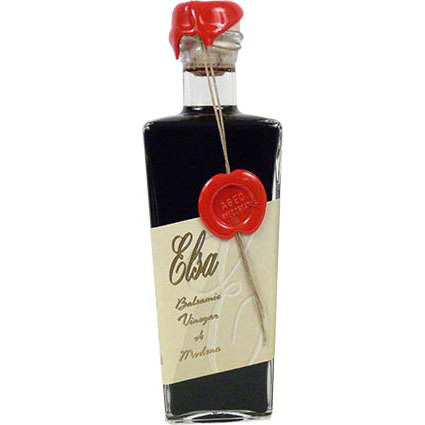 Authentic Balsamico di Modena. 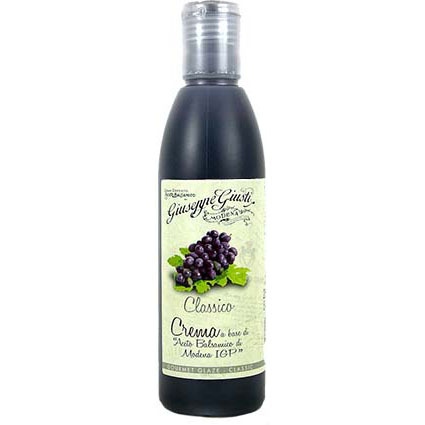 Use on green salads, fresh tomatoes or in marinades for chicken or meat. 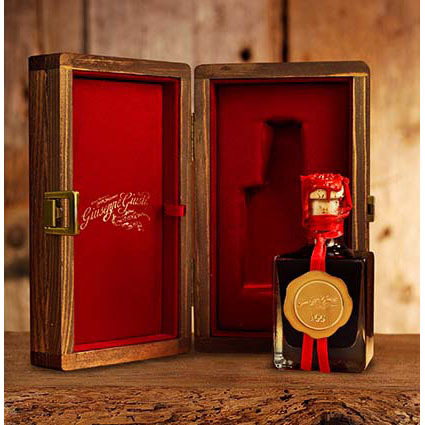 The 100 Year Reserve from Giusti is an extraordinarily unique product, personally extracted by the members of the Giusti family only on special request. It is stored in the casks which Pietro Giusti chose to take to the Parisian Exposition Universelle in 1889, earning a Gold Medal. Its complexity and perfection of flavor, able to give a long lasting taste, is a experience of paradise for true balsamic lovers. Serving Suggestions: To be used as an elixir to add a phenomenal complexity of flavors and enrich any culinary creation: extra old cheeses, fresh berries, the finest quality gelato, or to be savored alone. 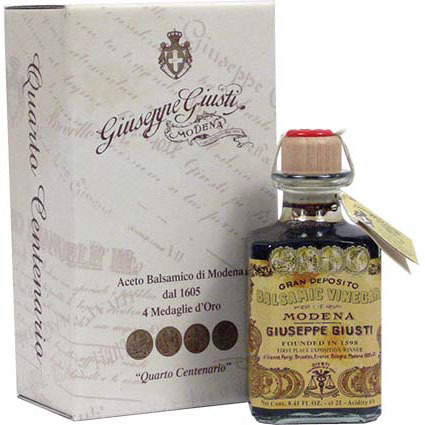 This special quality Balsamic Vinegar of Modena is a limited production created to celebrate the four centuries of Giusti's activities. Fourth Centenary, obtained from the most precious grapes, is aged for many years in barrels dating back to the 1800's, drawing aromas and flavors left centuries before. Full bodied, with an unmistakable aromatic bouquet and lasting sweet aftertaste, it is an exceptional complement for many recipes. Drizzle on a grilled steak or sauteed chicken, a wedge of Parmigiano-Reggiano, fresh strawberries or gelato. 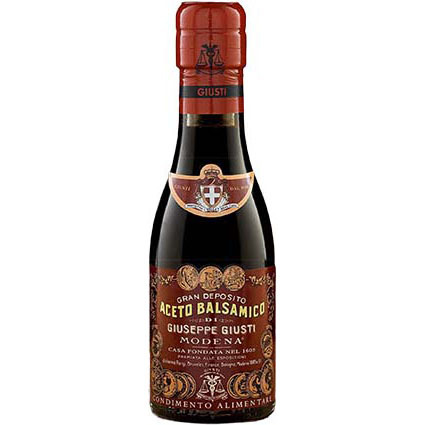 The glazes of Balsamic Vinegar of Modena PGI give body and density to the balsamic vinegar. In all the nuances of flavor, they are perfect for garnishing, decorating and enhancing creative and delicious recipes.